A 5,500 SF gut renovation of an old furniture showroom building provides a new loft office space for a private asset management company in Virginia. The client wanted to develop a workplace environment that supported his commitment to teamwork and the value he placed on collaboration. 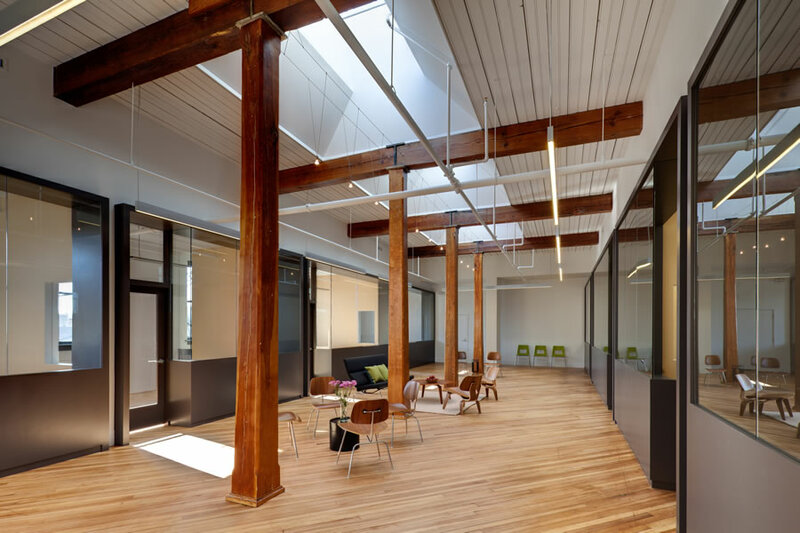 The office is broken into three discreet spaces: an front entry lobby with conference room, an private office area organized around a shared common space and a long gallery between them that connects the two areas like a bridge. There is also an small attic loft that is used for the occasional break and rooftop access. The lobby is flooded with north light through a custom glass and millwork enclosure that separates it from the conference room. The gallery is visually calm and very minimal in its detail - a contrast to the spaces at either end. Taking advantage of an additional area at the rear of the building and responding to the large, historic structural wood beams and columns that add character and warmth, we created a series of modern glass and millwork storefronts that act like display windows facing onto common seating area where employees can gather for an informal group discussion.